In this talk, I will start with describing the pervasiveness of image and video content, and how such content is growing with the ubiquity of cameras. I will use this to motivate the need for better tools for analysis and enhancement of video content. I will start with some of our earlier work on temporal modeling of video, then lead up to some of our current work and describe two main projects. (1) Our approach for a video stabilizer, currently implemented and running on YouTube, and its extensions. (2) A robust and scaleable method for video segmentation. I will describe, in some detail, our Video stabilization method, which generates stabilized videos and is in wide use running on YouTube, with Millions of users. Then I will describe an efficient and scalable technique for spatiotemporal segmentation of long video sequences using a hierarchical graph-based algorithm. I will describe the videosegmentation.com site that we have developed for making this system available for wide use. Finally, I will follow up with some recent work on image and video analysis in the mobile domains. I will also make some observations about the ubiquity of imaging and video in general and need for better tools for video analysis. 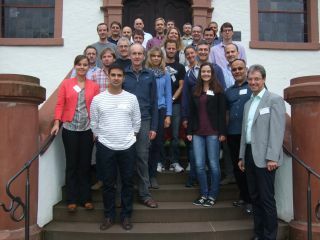 Participated in the Dagstuhl Workshop on “Modeling and Simulation of Sport Games, Sport Movements, and Adaptations to Training” at the Dagstuhl Castle, September 13 – 16, 2015. Computational modeling and simulation are essential to analyze human motion and interaction in sports science. Applications range from game analysis, issues in training science like training load-adaptation relationship, motor control & learning, to biomechanical analysis. 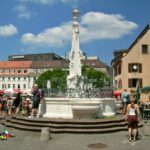 The motivation of this seminar is to enable an interdisciplinary exchange between sports and computer scientists to advance modeling and simulation technologies in selected fields of applications: sport games, sport movements and adaptations to training. In addition, contributions to the epistemic basics of modeling and simulation are welcome. In this talk, I will start with describing the pervasiveness of image and video content, and how such content is growing with the ubiquity of cameras. I will use this to motivate the need for better tools for analysis and enhancement of video content. I will start with some of our earlier work on temporal modeling of video, then lead up to some of our current work and describe two main projects. (1) Our approach for a video stabilizer, currently implemented and running on YouTube and its extensions. (2) A robust and scalable method for video segmentation. I will describe, in some detail, our Video stabilization method, which generates stabilized videos and is in wide use. Our method allows for video stabilization beyond the conventional filtering that only suppresses high-frequency jitter. This method also supports the removal of rolling shutter distortions common in modern CMOS cameras that capture the frame one scan-line at a time resulting in non-rigid image distortions such as shear and wobble. Our method does not rely on apriori knowledge and works on video from any camera or on legacy footage. I will showcase examples of this approach and also discuss how this method is launched and running on YouTube, with Millions of users. Then I will describe an efficient and scalable technique for spatiotemporal segmentation of long video sequences using a hierarchical graph-based algorithm. This hierarchical approach generates high-quality segmentations and we demonstrate the use of this segmentation as users interact with the video, enabling efficient annotation of objects within the video. I will also show some recent work on how this segmentation and annotation can be used to do dynamic scene understanding. I will then follow up with some recent work on image and video analysis in the mobile domains. I will also make some observations about the ubiquity of imaging and video in general and need for better tools for video analysis. 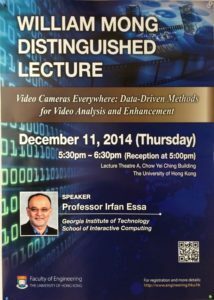 This event was hosted by the Visual Computing Center (Wolfgang Heidrich, Bernard Ghanem, Ganesh Sundaramoorthi). Daniel Castro also attended and presented a poster at the meeting. I will describe, in some detail, our Video stabilization method, which generates stabilized videos and is in wide use. Our method allows for video stabilization beyond the conventional filtering that only suppresses high frequency jitter. This method also supports removal of rolling shutter distortions common in modern CMOS cameras that capture the frame one scan-line at a time resulting in non-rigid image distortions such as shear and wobble. Our method does not rely on a-priori knowledge and works on video from any camera or on legacy footage. I will showcase examples of this approach and also discuss how this method is launched and running on YouTube, with Millions of users. Then I will describe an efficient and scalable technique for spatio-temporal segmentation of long video sequences using a hierarchical graph-based algorithm. This hierarchical approach generates high quality segmentations and we demonstrate the use of this segmentation as users interact with the video, enabling efficient annotation of objects within the video. I will also show some recent work on how this segmentation and annotation can be used to do dynamic scene understanding. Videos from the Computational Journalism Symposium (Jan 31 – Feb 1, 2013). The Computation + Journalism Symposium 2013, held Jan 31 – Feb 1, 2013, at Georgia Institute of Technology, Atlanta, GA, USA was a huge success. Please see the videos here of all the sessions. See me discuss computational journalism with Phil Meyer, and my slides and take-away points from the closing session.